Lynne with Bill "Superfoot Wallace"
Don The Dragon Wilson, Cynthia Rothrock and Superfoot Bill Wallace. These three fighters were congratulated and had photographs taken with these prestigious superstars. Making A Come Back Rhydian Tolcher-James aged 14 years who has had 3 years rest from training in martial arts to concentrate on his football career, has made an outstanding come back taking the Bronze Medal in the 45k category. He was unable to fight for Gold as he was warned 6 times during 2 fights about his power. Rhydian who has been concentrating on football for the past 4 years, now realises that his future lies in martial arts. He is known throughout many parts of the world as an Ambassador of Martial Arts, and appears in Dorling Kindersleys` Young Martial Arts Enthusiast Rhydian told the gem that he has started preparing already to take the Gold Medal and World Championship for Wales next year. Rhydian won the Sports Personality Award in 1995, and the National Sports Millennium Award for the Year 2000. Rhydian became a Black Belt at the age of 6 years in Muay Thai and the age 7 years in Karate. He has been a Winner, Gold Medalist, and Cup Holder of many major tournaments in the past and is now starting back on that road to stardom once again. Rhydian attends Llanilltud Fawr Comprehensive School, Llantwit Major. Birthday Girl Young Lauren Allen a novice competitor and her very first major tournament took the Silver Medal in the 30k category on the day of her 8th birthday losing to a very experienced 11 year old Canadian Fighter. Lauren who has only been training for 12 months told the gem I really enjoyed being part of this important event, and know I have a lot of hard work ahead of me, but I am preparing to take the Gold Medal next year. Lauren attends Holton Road Primary School. Shy but Talented 16 year old Natasha Foscolo took the Bronze Medal in the +65k category.with this being here very first major tournament. Natasha is a very talented martial artist and has a great future in front of her. She has the ability to succeed next year hopefully taking the Gold Medal and World Championship for Wales. Natasha was beaten by a very experienced Canadian fighter, and did extremely well to reach the third round. Natasha is also an excellent instructor, and hopes to one day run her own clubs. She told the gem I know there is a lot of hard work in front of me, but I am sure I will bring a Gold Medal back to Wales next year. Natasha was a pupil at Bryn Hafren Comprehensive School. All students with the exception of Rhydian Tolcher-James have never fought in a major tournament before. They are a credit to Wales, their instructors and parents. Brett Davies aged 13 a novice competitor reached the 2nd round but unfortunately was beaten by an experienced American fighter. Brett displayed an outstanding technical ability and told the gem I will succeed next year. 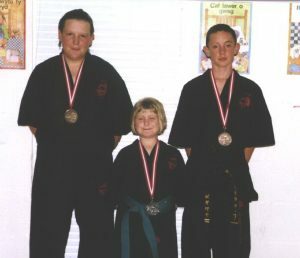 Christopher Brown aged 10 again a novice competitor had to fight a 16 year old who weighed in the same weight category. Chris had bad luck having to fight this more experienced and older fighter from Macedonia. Chris told the gem Next year will be mine. Tara Bullock aged 13 again a novice competitor was up against older and more experienced fighters who weighed in in the same weight category. Tara fought extremely well and unfortunately lost to an experienced Austrian fighter. She told the gem I am going to train really hard during the next 12 months to bring a medal back next year. Kimberley Thomas aged 13 showed excellent technical ability, but was beaten by a more experienced American fighter. Kim has great potential and told the gem With a lot more training during the next 12 months I am confident of a medal to return home with. All these novices fighters are future World Championship quality and if they are successful to qualify for next years World Championships will certainly return in the medal bracket. All students told the news, without lynnes guidance we would have never made it. This tournament was represented by 72 countries competing in Thai-Boxing, Full Contact, Semi-Contact and Light Contact,and many different forms of kata. Various forms of martial arts for each individual to compete against. A most prestigious event in the calendar of martial arts. With the hope of Olympic recognition these youngsters amongst others may be taking part in the next Olympic Games.